We do not value volunteering. We ask for it. We badger for it. We thank people for it. But, we do not value it. We do not put a value on volunteering. We think it is free. Volunteering is free, in that it is the free act of giving one’s will. That meaning of “free” does not mean of no value. By looking at volunteering, the free giving of one’s will, as of no value, we end up quickly in “doing good” philanthropy, which does not scale. The impact remains small, and the resilience of the impact remains low. By not valuing volunteering, we are valuing the person’s co-investment at zero. And with zero value in co-investment, we don’t value the return on that co-investment, so there is no return on the co-investment. Since the volunteer actually assumed the opportunity costs of the volunteering, when they receive nothing back, the return on the co-investment is actually negative. It costs me to play, with no return–a net-negative investment. Yet, we volunteer, because it makes us feel good. We see the impact of our efforts in cleanliness of the schoolyard after a family work day, the paying of the bills because of our work with the accounting group, people fed because we served in a soup kitchen. If we value the will one gives, then we can honor the value of the co-investment. Even with a basic assumption of the value of an hour, estimated by some as US$24/hour in the USA in 2017, we are asking the question of what is the co-investment the volunteer is making. We can then ask, what is the return on the co-investment? What did your co-investment lead to, what is the value of the “return” for your co-investment? The reason we cannot usually answer this question is because we do not ask it. Lots of people are innovating deeply in this space. One such massive set of innovations is in complementary currencies. Measuring the current of what is flowing, what is flowing through you in your interaction, your co-investment, and what flows in the community because of your co-investment of currency. From valuing volunteer time and banking hours to valuing social and natural capital, there are many ways to value the will one puts forward freely. What is free is the choice to give one’s will. It has a value. It is a co-investment. When we ask the question of the value of the co-investment, we can also begin to ask the question of what is the return on the co-investment. The value of a clean schoolyard, of bills paid, of mouths fed. That provides a positive return on co-investment. A return that is possibly orders of magnitude greater when we ask these questions of co-investment of one’s will, of volunteering, than when we don’t ask these questions. Now that could support its own scaling of impact resilience. All elements in an Agreements Field are always active. Always. This is the picture of Homo lumens interacting with the self, other, group, nature, and spirit. All five relationships are always there, whether consciously included or not. The three levels of perceived reality are always there, whether they are perceived or not. People are having an experience of less or greater vibrancy. The interactions are resulting in outcomes, of lesser or greater impact and resilience. The agreements, whether consciously chosen or unconsciously accepted, are there. This means that the whole experience of Homo lumens is always present. The whole agreements map is active. That only part of it is seen by the people interacting means that the other part is active and not seen. In their latest book, An Everyone Culture, Harvard professors Robert Kegan and Lisa Laskow Lahey, suggest that most people are actually engaged in two jobs at work: (1) the contribution they are hired to make; and (2) protecting themselves. “Imagine you’re paying a full-time wage for part-time work to every employee, every day” (p.2). “In businesses large and small; in government agencies, schools, and hospitals; in for-profits and nonprofits, and in any country in the world, most people are spending time and energy covering up their weaknesses, managing other people’s impressions of them, showing themselves to their best advantage, playing politics, hiding their inadequacies, hiding their uncertainties, hiding their limitations. Hiding. We regard this as the single biggest loss of resources that organizations suffer every day” (p.1). In measuring the impact resilience of a set of agreements, we have identified the “costs of scarcity,” the costs of not engaging the full human being. The costs of Kegan and Lahey’s “second job” are just the start. Another way of understanding this is to realize that the agreements that are seen and in the group’s awareness might be aligned with the group’s deeper purpose. Often they are not, but they might be. Our recent research suggests that those agreements that remain unseen, that are not part of the group’s awareness, where Homo lumens is not fully engaged, are usually not aligned with the group’s deeper purpose. While unconscious competence might generate temporary alignment sometimes, it is not resilient to perturbations in the system, which always appear. This lack of alignment has huge costs, much greater than the costs of the second job Kegan and Lahey highlight. People are expending energy towards a purpose other than the group’s–vast amounts of energy. If all elements of the agreements field are always active, they are doing something. The question is whether this activity is aligned with the intended purpose or not. Whether it is moving the group towards the purpose or away from it. Most, if not all, of the elements that are not consciously part of the agreements exact a huge cost. This changes the question, from whether it would be nice to incorporate more of the learning and possibility experiences, to whether it is highly ineffective and inefficient, when interacting with human beings, to not consciously choose to incorporate all three levels of perceived reality. The first assumes an outcomes-only reality is more real and the development and potential levels of perceived reality are nice add ons. The second assumes that humans are always in the process of being in potential and development and tangibilization. For the first, engaging people requires a huge investment. For the second, not engaging people has a huge cost. Our recent research, and that of Kegan and Lahey, suggests that the second better explains why some groups have much better experiences and impact resilience than most. Which do you choose? You interact to have experiences and to get results. That is why you do what you do. The agreements you consciously choose or unconsciously accept define how you interact. Those agreements are based on embedded, interwoven assumptions. Our experiences, outcomes, agreements, and assumptions form an “agreements field.” A field is the environment in which individuals or groups interact. This concept is widely applied in physics, and less so in the social sciences. 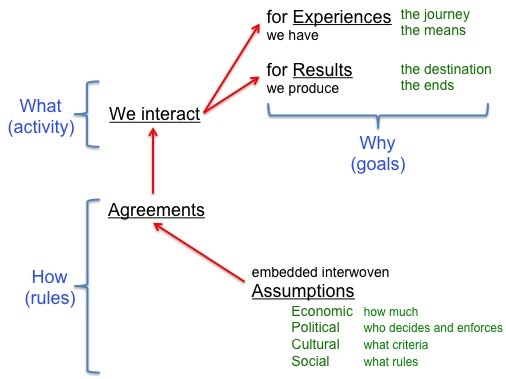 By an agreements field, I suggest that in looking at our experiences, outcomes, agreements, and assumptions, we are describing one entity, from multiple perspectives–one field where we can perceive the outcomes and the experience of people interacting based on conscious or unconscious agreements founded on underlying assumptions. One field. One agreements field. To describe the different perspectives within the agreements field, to map the social topography of agreements fields, we have developed and globally tested a set of mapping tools. Experience. The Vibrancy Survey maps the experience people have in their interactions, as described through their five primary relationships. Outcomes. The measures of impact resilience map the outcomes a group achieves and the resilience of those outcomes, based on the total value potential available, the total value realized, and the costs of scarcity. Agreements. 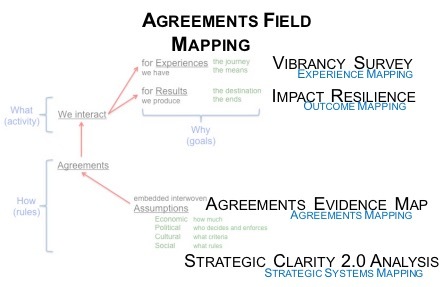 The Agreements Evidence Map describes the evidence found to substantiate the level of agreements in an agreements field, as seen through the four lenses of economics, politics, culture, and sociology. Assumptions. The Strategic Clarity systems analysis maps the underlying strategic systemic factors influencing the ability of a set of agreements to achieve the desired outcomes and experience. Together these four mapping tools describe four key perspectives of an agreements field. Our work at the Institute for Strategic Clarity now focuses on further developing and applying agreements field mapping to map the global social topography of human agreements, through the Global Initiative to Map Ecosynomic Deviance and Impact Resilience (MEDIR). With our colleagues around the world, we are beginning to see that the social topography of human agreements is as varied as our earths’s geological topography. Peaks and valleys in many forms. Treasures abound. Things we have never imagined around every corner. The flatearthers of human agreements are missing out–there is a lot of treasure out there, ready for all of us to discover, marvel at, and learn from. It only takes the quest(ion) to find it. If you are interested in contributing to this global initiative, please contact us. I was interviewed recently as part of a Monitor Institute study for the Rockefeller Foundation on “How Funders Can Support and Leverage Networks for Social Impact.” The final report is out, in the form of an interactive toolkit (ow.ly/QxgqG) — please feel free to share it. My contribution is based on my research into deviant groups — what makes some sustainably amazing and others sustainably awful. 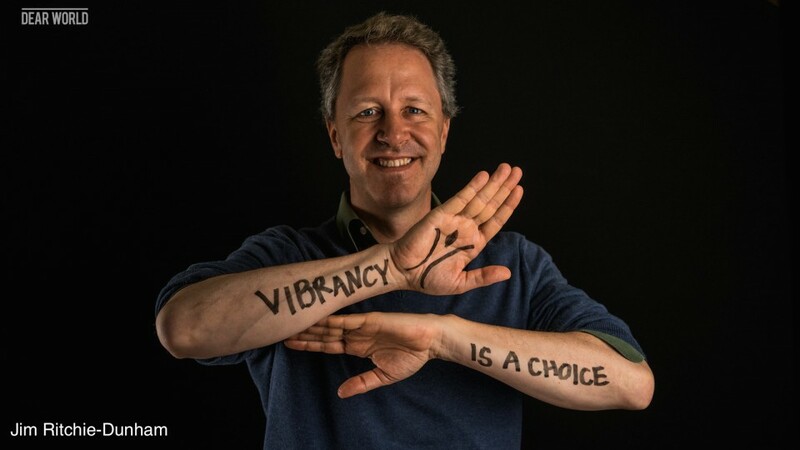 Through our Ecosynomics research at the instituteforstrategicclarity.org in 93 countries, we have identified 1000s of groups who have off-the-chart, amazing experiences and outcomes everyday. The Monitor study incorporates some of what we have learned about the collaborative nature of their work. If you know of any such groups, I would love to hear about them.